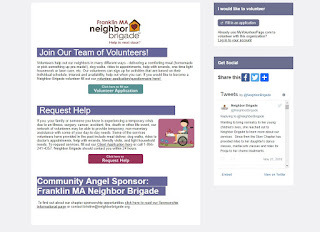 Franklin Matters: Franklin's Neighbor Brigade is ready to help! "Welcome to the Franklin chapter of Neighbor Brigade! Our chapter was formed in April 2012. Whether you are seeking assistance or looking to provide help to another, you’ve come to the right place. Our volunteer chapter leaders donate time to coordinate the needs of families in crisis with the volunteers who want to help. Read on to learn more about their passion for Neighbor Brigade, and help us spread the word! We are always looking to expand our presence here in Franklin among volunteers and potential recipients alike. 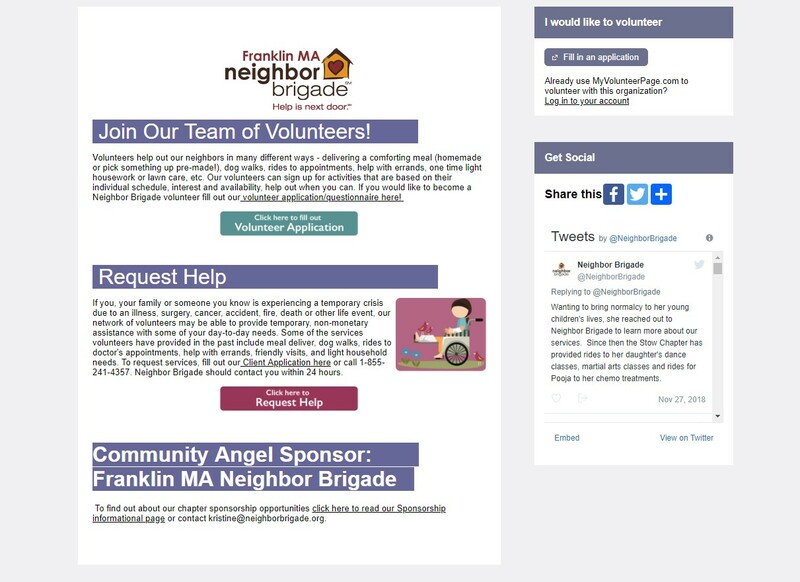 Neighbor Brigade establishes community-specific networks of volunteers that can be mobilized to help residents facing sudden crisis manage day-to-day tasks such as meal preparation, rides, and basic household chores. Our chapter is just one of 29 chapters helping their neighbors in crisis! To learn more about us and our other chapters, please visit our home page here." "If you, your family or someone you know is experiencing a temporary crisis due to an illness, surgery, cancer, accident, fire, death or other life event, our network of volunteers may be able to provide temporary, non-monetary assistance with some of your day-to-day needs. Some of the services volunteers have provided in the past include meal deliver, dog walks, rides to doctor's appointments, help with errands, friendly visits, and light household needs. To request services, fill out our Client Application or call 1-855-241-4357. Neighbor Brigade should contact you within 24 hours."